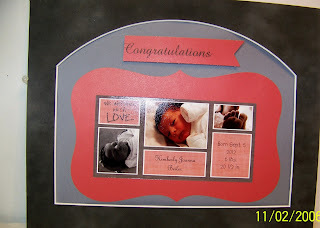 Just A Scrappin' Challenge for April 18, 2013 is NEW Arrival, make a card, LO, or project for a new baby or pet. I made a project for a friend, I used the baby announcement to make a wall hanging for the baby's room. I took a solid card stock that matched the color of the brushed pink in the card and used a pre-made dark gray frame for the outside then used the light gray for the background. I cut one < rctngle8> at 6 1/2 inches from Cricut Art Philosophy cartridge, centered the announcement on to the pink card stock, taped it to the light gray and added the frame. Computer printed the congratulations, cut a flag to fit above the matted card. Join use at Just A Scrappin'! Aww! You are so thoughtful to create this wall hanging for your friend. She is going to love it! This is great! Your friend will cherish this forever! What a precious and loving gift for your friend. I still have handmade things from when my daughter was born, nearly 28 years ago...so I'm sure this gift will be a keeper for your friend as well. Outstanding job!